I've been watching documentaries and saw the Nanny McPhee movies (didn't care for those much) and, uh, if you read this blog - you know I've been reading! 3. This should be up higher on the list but I'm particularly grateful for my husband who has been doing double-time at home, taking care of (and playing with!) the kids when I'm out of steam and can't move. He has been making lunches and dinners and cleaning up afterward and does it all without complaint! He never makes me feel guilty as I close the bedroom door and collapse for naps. I have a fantastic husband. Speaking of which, way back when - when we were getting to know one another while taking ballroom dance classes - we used to waltz to this particular song which I liked then but like much better now. It was stuck in my head the other day and I was remembering. This song was becoming true "way back" then. It's very true now. 4. Aaron Keyes. He's my "new discovery" in the world of contemporary Christian music. I've been enjoyed his song "Psalm 62" and when I started following the Youtube suggested links to his other music, I found that I liked it! His lyrics are solid and his devotion to truth obvious. I've never heard his songs played on the radio although they should be. It feels like I found my "other SCC" (i.e., I know I can buy an album and not be disappointed - or infuriated - by lack of substantial truths.) After listening to the Youtube videos, I tracked down a copy of his album, Not Guilty Anymore . He has interesting hair, to be sure, but if you haven't given him a listen, I recommend him. Close your eyes if the hair bugs you. He wrote a blog post re: having Concrete Foundations (linked) in choosing worship music. He requires his students to list 10 Bible verses to back up the lyrics of any song that they want to sing in a worship setting. That's admirable. Love it! Wish more worship leaders would do the same thing for themselves and anyone on their team. This is his song "To Make Your Name Great" which I discovered on my Youtube binge. 5. A couple of date nights here in the not-too-distant past. We haven't had very many in the past few months and I kinda didn't realize it. Then we had a babysitter lined up for twice in one week! What are we to do with our sweet selves!? First, went to go see The King's Speech in the theater. (Loved it.) Then we went to go and see comedian Tim Hawkins perform and that was a hilariously good time! One and a half hours of solid-and-very-much-needed laughter. We were so grateful for the blessing of being able to get away by ourselves for a few evenings. I don't anticipate that happening very much in the next few months as we adjust to life with a newborn so we'll take what we can get and be enormously happy with it! What about you? What things are you grateful for this week? Thanks, Susanne, for faithfully hosting and reminding us to look back and be grateful for the "little" things, as well as the big things, that God sends our way. I’ll have to check out Aaron Keyes. I love that he requires his students to back up lyrics with scripture. Sounds like you've been on bedrest for a while? I hope this last month goes quickly for you! I've enjoyed browsing through your blog. Lots of great reviews. No, not bedrest. I've just been so achy, sore and have stretched so much that my muscles aren't really keeping up the pace and moving around too much actually *really* hurts. So there's been a lot of sitting still, sitting down and just not moving. Hey I liked the Aaron Keyes link, I had not heard of him. Thanks for sharing it! :) Congrats on ALMOST having that sweet baby to hold.....hang in there. Sounds like hubs has been wonderful! And we saw Tim Hawkins several years ago......it does make for a FUN night out!! 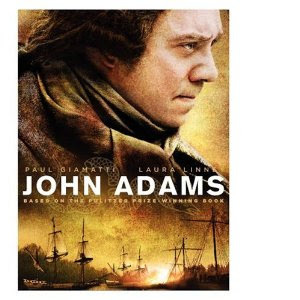 I also enjoyed the John Adams miniseries. Very well done. We heard glowing reviews of John Adams, so we checked it out from the library. The librarian who did the checking out told me that she and her husband couldn't finish it. "Oh!" I said while thinking, "They must not be history buffs." And then we couldn't finish it, either. Welcome back! So excited about that last month -- and your hubby sounds like he's been wonderful. 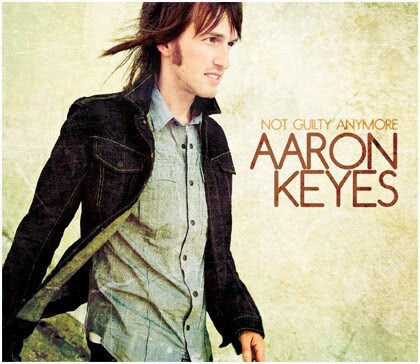 I'll have to pass along the Aaron Keys link to my son who's a worship leader for his church. Take care of yourself - enjoy Spring! How exciting...one more month and then you can introduce us to your beautiful new baby. I love that song you waltzed to. Funny but I always just thought it was a musical piece from "Shrek". I had no idea it was a "real" song. LOL. A gem of a husband, books, movies, music are all wonderful. And last month of pregnancy - take care. Hurray for the final month! And dates nights while you can get them! Must be a riot to see Tim Hawkins in person. I didn't realize that was a "real song" either. Pretty! Its great that your husband is so helpful, that will be even more wonderful once the baby comes! May the next month pass quickly! I hope you enjoy this final month. I know how uncomfortable it can be. And why do people feel the need to tell a woman how huge she is? When I was pregnant with my twins, well.. I don't need to tell you! I loved John Adams, and also love Aaron Keyes and Tim Hawkins. I'm going to have to wait and see the King's Speech on DVD, but I'm looking forward to it! Welcome back to FFF...I think there are more of us out there that always find our way back when we don't know where to start. We will wait to hear about the news of the birth of your next child. I loved the King's Speech..and especially the music. Sounds like you have a caring husband who understand what you are dealing with...He's a keeper. We'll wait for the good news.